The Gilmour Heavy Duty Adjustable Circular Sprinkler had 237 customer comments and 21 answered questions on Amazon. I've read through the reviews and condensed the results into this review. I hope that this helps you when shopping for a sprinkler. The Gilmour Heavy Duty Adjustable Circular Sprinkler is a heavy-duty die cast metal sled base with a brass and zinc head. This sprinkler will cover up to 5,800 square feet with a 86 diameter circular spray pattern which is a 43-feet spray distance. It features an adjustable collar for partial to full circle coverage. An easy to turn dial helps the user to set the spray distance. The diffuser pin helps to customize the spray from powerful jet to gentle mist. This sprinkler is heavy duty and will not fall over in the wind, or get knocked over as easily as many of the lighter in weight sprinklers. With some of the lighter sprinklers on the market, a common complaint is that even the slightest pull on the hose can make the sprinkler to tip over. 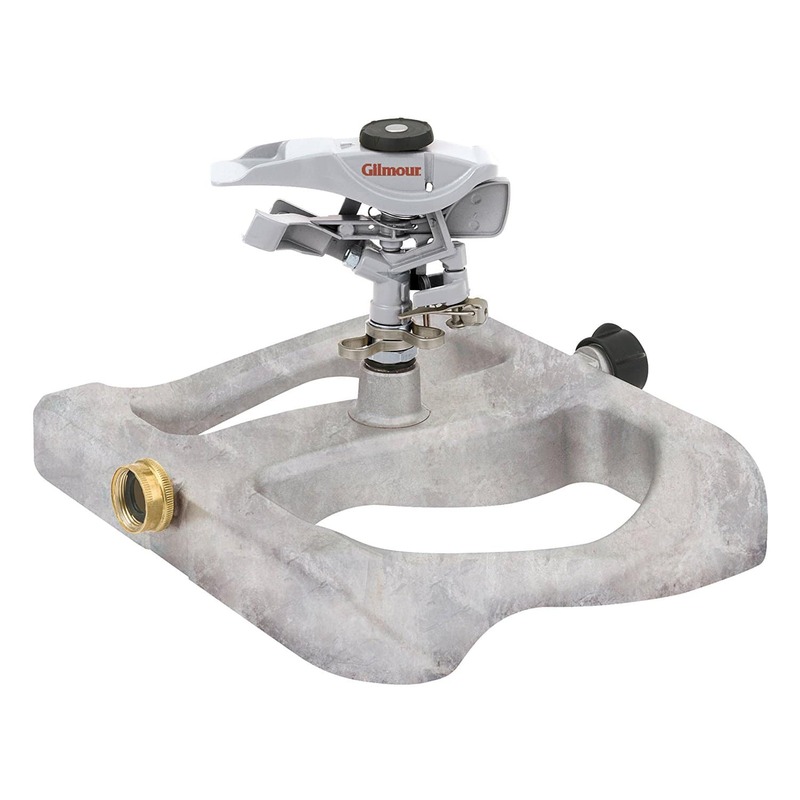 The Gilmour Heavy Duty Adjustable Circular Sprinkler is popular because it stays put. One customer had this to say, "It is truly heavy duty and quite sturdy. I've purchased, tried and use many different sprinklers, and this is by far my favorite. Not only is it very heavy/sturdy (so it stays firmly in place), but is absolutely shoots water farther than any other sprinkler that I've tried." The adjustable collar allows you to control the sprinkler head’s rotation. When the lever is pushed down, the sprinkler can be set to any part of circle coverage. With the lever flipped up, the sprinkler head will rotate in a full circle. The diffuser screw allows for easy fingertip adjustment of the water stream. You can adjust the water spray from heavy stream to fine mist with just the touch of a fingertip. Being able to adjust the water stream is an asset as this customer explains, "The water stream is strong and the sprinkler head movement is accurate. The metal sled base means no embedment into the soil which would eventually rot out the cheaper Metal Spike version." The distance control dial on the top of the sprinkler head is a feature that allows you to adjust the spray distance. Customers liked how they could easily control the distance and how far it could spray. One customer had this to say, " The adjusting knob works well if I want to turn down the distance and increase the volume, but cranked all the way up it shoots really far." A series connection gives the option of attaching additional sprinklers for watering multiple areas. This is a nice feature if you have a large lawn or a lawn that is shaped uniquely. The series connection will allow you to put the sprinklers into any pattern that you choose. The Gilmour Heavy Duty Adjustable Circular Sprinkler is a heavy duty sprinkler with some nice features. A rotation collar allows you to control the sprinkler head’s rotation while a diffuser screw allows for easy fingertip adjustment of the water stream. The amount of distance that you would like the water to travel is also easily controlled by turning a control dial. Additional sprinklers may be attached to this sprinkler. It is more expensive than some of the other sprinklers, but it also heavy duty and built to last. Here are some top questions that I found for people considering buying a Gilmour Heavy Duty Adjustable Circular Sprinkler. Can this be hooked up to another to cover a large lawn? Yes. It has a male tap where a hose can be connected to feed another sprinkler. How do you adjust the rotation of the sprinkler, say down to 90 degrees or up to 180? There are two stops that will rotate around the stem. You can set them for any angle you wish. If you want it to rotate a continuous 360, you just lift the trigger mechanism so it clears the stops. Will this sprinkler rotate 360 degrees? Yes. You just lift up the trip arm so that it clears the stops and it will continue running in full circles.